High-throughput data generation and genome-scale stoichiometric models have greatly facilitated the comprehensive study of metabolic networks. The computation of all feasible metabolic routes with these models, given stoichiometric, thermodynamic, and steady-state constraints, provides important insights into the metabolic capacities of a cell. How the feasible metabolic routes emerge from the interplay between flux constraints, optimality objectives, and the entire metabolic network of a cell is, however, only partially understood. We show how optimal metabolic routes, resulting from flux balance analysis computations, arise out of elementary flux modes, constraints, and optimization objectives. We illustrate our findings with a genome-scale stoichiometric model of Escherichia coli metabolism. In the case of one flux constraint, all feasible optimal flux routes can be derived from elementary flux modes alone. We found up to 120 million of such optimal elementary flux modes. We introduce a new computational method to compute the corner points of the optimal solution space fast and efficiently. Optimal flux routes no longer depend exclusively on elementary flux modes when we impose additional constraints; new optimal metabolic routes arise out of combinations of elementary flux modes. The solution space of feasible metabolic routes shrinks enormously when additional objectives---e.g. those related to pathway expression costs or pathway length---are introduced. In many cases, only a single metabolic route remains that is both feasible and optimal. 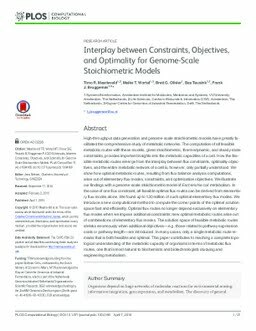 This paper contributes to reaching a complete topological understanding of the metabolic capacity of organisms in terms of metabolic flux routes, one that is most natural to biochemists and biotechnologists studying and engineering metabolism.